Is it just me, or does everybody love everything Italian? OK, maybe I was Italian in a past life, because my dad’s Irish and my mom’s Polish but I can’t get enough Italian in this life! I’ve been a fan of Dean Martin since the early 60s, listening to Martin LPs on my mom’s stereo. Not to mention I’ve seen all 264 episodes of the Dean Martin show, (624 is my birthday, it’s kismet). In search of an authentic Veal Piccata and a little bit of Italian ambiance I headed to Pepper’s. An old friend of mine, Sparky, and a Lakewoodite, has been wanting to try the place for months. However, the timing was always off (they open at 5pm) or there was always a line out the door. Tonight’s the night, bring it on. Upon walking down the sidewalk to the entrance, off to the west side of the building is a quaint little patio, adorned with wrought-iron furniture and Christmas lights. Deano’s “Baby, It’s Cold Outside,” was ringing in my ears, so we headed inside. 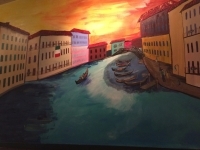 I was pleasantly pleased to find an enchanting mural of Venice, Italy (it’s on my bucket list) painted on the main wall by our very own St. Ed’s students. On the opposite wall in the petite but cozy, dining room is Deano himself, with a framed picture of The Rat Pack. OK, I’m almost in heaven. All I need now is for Deano to come back from the dead and saunter over to my table. I settled for a cup of Italian wedding soup instead, and a glass of Pinot Noir. We went early, 5:30pm, and on a Tuesday. We were lucky to get the last booth available. A friendly older gentleman was going around the tables chatting with various customers. I found out he was the owner, Bob Buck. My soup came, and I wasted no time. It was good, along with the little soft Italian rolls with real butter, (I have a thing about REAL butter). Buck came over to our table and chatted with Sparky a little bit about the history of the place, since Sparky’s lived in Lakewood his entire life. Seems Buck and his wife were regular customers and one night the former owner said, “the place is up for sale.” “I’ll buy it,” Buck answered, and the rest is history. Pepper’s is twenty years plus now in dishing out pasta, rolling dough for its award-winning pizzas, and they’ve developed quite the reputation for their in-house made grape pie. (I didn’t have room). The crowd continued to roll in and the atmosphere still reminded me of the “feel” of a few family owned restaurants in Little Italy. Buck is to Pepper’s what Sam Malone was to Cheers. Alas, my Veal Piccata has arrived, Sparky ordered the Veal Parmesan. I devoured mine, with class of course, lol…while Sparky had to ask for a to go box. I passed on the side of pasta, and ordered the broccoli instead, that helps save room for the real deal. Sadly, I didn’t have enough room for the infamous grape pie. We paid our check and chatted with Bob on the way out about his newest arrival, granddaughter Audrey Irene Buck, whose photo graces the wall. Next time you’re in the mood and can’t help singing “Everybody Loves Somebody Sometime” share the love and head over to Pepper’s. Eva Starr recently moved back to her heartland state of Ohio, after the transition of her mother. Starr spent the last ten years in San Diego digesting the alluring buffet of wisdom the West Coast had to offer. While there she attended the San Diego Culinary Institute, and worked as a chef in San Diego. Starr also published her book Quit ‘Should-ing’ on Yourself, while in San Diego featured at the 2016 LA Times Book Festival, and Oprah Winfrey’s Reading Room. She continues to follow her metaphysical path, teaching Astrology, hosting her television show Reach for the Moon, and exploring the diversified culinary delights Lakewood has to offer.